Because American Storm Water is the largest storm water management company in the Western United States, we are able to provide superior in-house catch basin screen service and maintenance with our experienced storm water personnel and certified fleet of specialized equipment to help keep our customers one step ahead of government regulations regarding storm water pollution. We offer a variety of storm water management services that to take care of your Catch Basin Screen Installation needs for the Surf Gate, Debris Dam and Catch-All storm water products. Our Portable Air/ Mover Services will ensure your catch basin screens are clean of debris and trash. 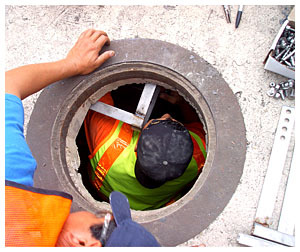 The Sewer/Jetter Services we offer will clean out any storm drain blockage and debris, and our Sewer Manhole Rehabilitation Services will repair and re-line deteriorating concrete manholes. If you would like to receive more information about the storm water services American Storm Water provides contact customer care or call 310.354.9999.